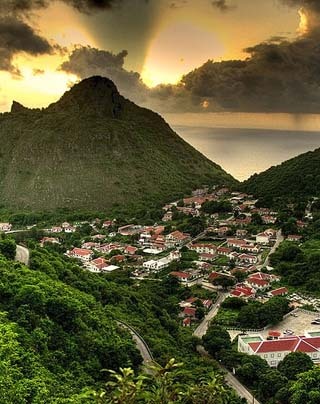 Saba, the smallest special municipality of the Netherlands juts abruptly out of the blue Caribbean Sea. It mainly consists of the remains of a (potentially-active) yet dormant volcano named Mt. Scenery. The origin of its name is still disputed to this day; some say it's from an Arawak Indian word meaning "rock," while most experts claim it's of Arabic and Greek origin. When Christopher Columbus spotted the island in 1493, he noted its position but did not come ashore because of the rocky coastline and strong offshore currents. History reports that in 1632 an English ship ran aground here and a small group of Englishmen became the first Europeans to set foot on Saba. Later rescued, they found the island rugged and uninhabited. Saba was claimed for France in 1635, but just a few years later the Dutch West India Company, from its base on the nearby island of St. Eustatius, sent a group of people to colonize this uninhabited rock, and colonize it they did. Over the next two centuries Saba was controlled (or traded) among the British, Dutch, French and some pirates of note. And like most other islands in the Caribbean, some African slaves were imported to do the work. With the above mentioned minor exceptions, The Netherlands have been (firmly) in possession of the island of Saba since the early 19th century. The island's small size has made it a secluded long-time haven for some, and in fact, the local population is less than 1,500, and most trace their family names to some earlier inhabitants. 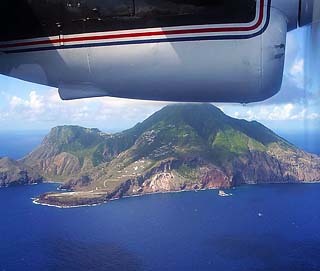 Saba has a rugged, steep topography, with most of the island sloping (rather dramatically) to the sea. Consequently, farming is all but impossible so most revenues come from tourism and the sea. There's a road (one road), and it took a masterful engineer and a few dozen years to complete. Visitors are often advised to leave the driving to experienced locals. And yes, there's an airport, but its landing strip is one of the shortest commercial runways in the world, so obviously no commercial jets, as only small airplanes are able to land. Saba is famous for its numerous scuba diving venues, eco-tourism opportunities, lobster fishing, a distinct lack of commercialism, and a relaxing, isolated solitude. In addition, this somewhat little-known speck of land is one of the favorite honeymoon destinations in all of the Caribbean.